Chopin and Beyond is a fascinating account of Maestro Byron Janis, perhaps the most famous concert pianist of the 20th century. There, however, is more to Janis than extraordinary piano playing. There has always been a strong connection between Janis and the great Chopin. Shortly after his birth, Janis’ parents stated that the infant strongly resembled the late composer. Janis learned to play the piano at an early age. As a man, Janis discovers not one but two lost Chopin waltzes when staying at a friend’s chateau in France. Other strange occurrences followed Janis throughout his life. In the book he talks about a UFO sighting, as well as one very strange paranormal experience at a French cemetery. And of course there is Chopin’s death mask. He also talks about his close friendship with Uri Geller. The paranormal isn’t all the book is about. 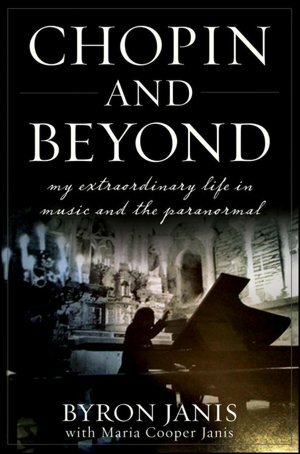 Chopin and Beyond goes into depth about Janis’ career, the disastrous accident which nearly destroyed his hand, and later in life, Janis talks frankly about how his battle with a crippling form of arthritis. This is a remarkable and fascinating book, about an equally fascinating and remarkable man. This is one of those biographies I couldn’t put down. I could go on at length about all the things Janis has written. But that would spoil the surprise. If you’re not familiar with Janis’ work, you can find some of his music on you tube. Of course, reading this biography while listening to his music is wonderful too.